Your liver is responsible for filtering every drop of blood that comes from the digestive tract, and then it metabolizes and eliminates the toxins and chemicals that it encounters. It’s also responsible for secreting bile, an aid in the digestive process. A sluggish liver that’s not operating optimally will affect the health of your whole body. The toxins the liver usually removes can stay in the body, causing damage and making you feel unwell. Thankfully, there are several simple things you can do that can have a positive impact on your liver! 1. Eat liver-happy foods. These include garlic, leafy greens, grapefruit, green tea, and grains, along with apples and avocados. These foods are known to help support and nourish the liver, while not overburdening it. 2. When your liver needs a little love, avoid processed foods, alcohol, and foods high in sodium and sugar. 3. Stay hydrated. Drinking the right amount of liquids helps the body to flush toxins out of the liver and increase optimum health. 4. Do gentle liver-stimulating exercises. One simple exercise you can do is to sit crosslegged on the floor with your back straight. Simply turn slightly to the right and then to the left. This helps stimulate and increase blood flow to the area without putting undue strain on the body. Start with 10 repetitions, then gradually increase to 100 per day. Moderate exercise also can be beneficial as it helps to decrease insulin resistance and fatty deposits in the liver. 5. Avoid unnecessary medications. Ask your doctor which of your medications are metabolized through your liver and if there are alternatives you could use instead. Replacing some popular pain reducers with alternatives such as Arnica Homeopathics can decrease the burden on your liver. 6. Love your gut. Some studies have shown that liver health is directly impacted by gut health and poor gut flora. Using fermented foods or a daily probiotic can help to both increase and diversify the population of gut flora. 7. Sip some tea. Several herbs have historically been used to help support the liver. Dandelion, Turmeric, Peppermint, Milk Thistle, Barberry, and Rosemary are the most well known. 8. Use spices and herbs in cooking. Garlic, Turmeric, Rosemary, Oregano, and Thyme are encouraging to the liver and can be used regularly in cooking to provide ongoing support. 9. Take your liver-happy supplements. Silymarin Liver Support, Digestive Enzymes and Digest Best, Red Raspberry Leaf, and Vitamin C (Gentle C, Rosehip C, and ChewC) can all contribute to the liver’s wellbeing. Dig deeper! Learn about choosing probiotics, improving gut health, and creating herbal tea blends and brewing tea. Grandmothers have known for centuries the power of both culinary and medicinal herbs to aid the body in cleansing and restoring vitality. Encouraging vitality is often a completely different concept than the traditional viewpoint of Western medicine, which typically reacts to a disease but doesn’t encourage wellness from the start. In centuries past, traditional elders knew the importance of aiding the body in keeping well. It was just this past fall when I read the value of using springtime herbs to help eliminate the toxins accumulated over the wintertime. I think it’s brilliant that each spring, the right herbs to create a cleansing tonic pop up in our yards! I laugh because these healing herbs are the very “weeds” most people spray to kill. In the midst of my current herbalist coursework, I have found that often things we consider a nuisance in our manicured lawns are herbal gifts ready to nourish and revitalize our bodies. 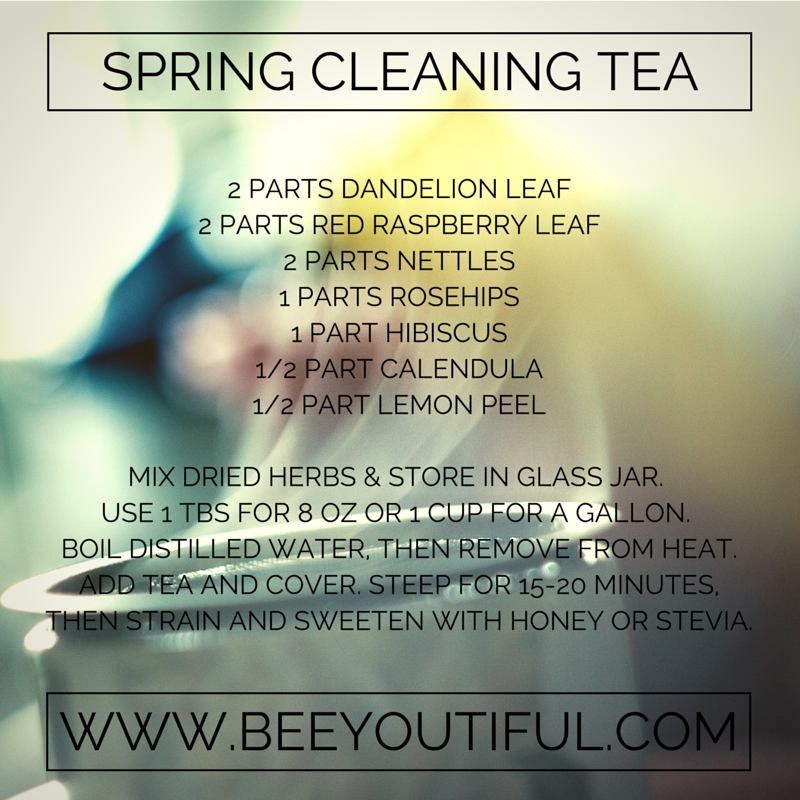 I hope you will join me in appreciating the beauty and wisdom of spring herbs, and have a cup of delicious Spring Cleaning Tea to encourage health and vitality. Mix all the dried herbs and then store in a glass jar. Use 1 tablespoon for 8 oz or 1 cup for gallon. Boil distilled water and then remove from the heat. Add tea and cover. Let steep for 15-20 minutes, then strain and sweeten with honey or stevia.